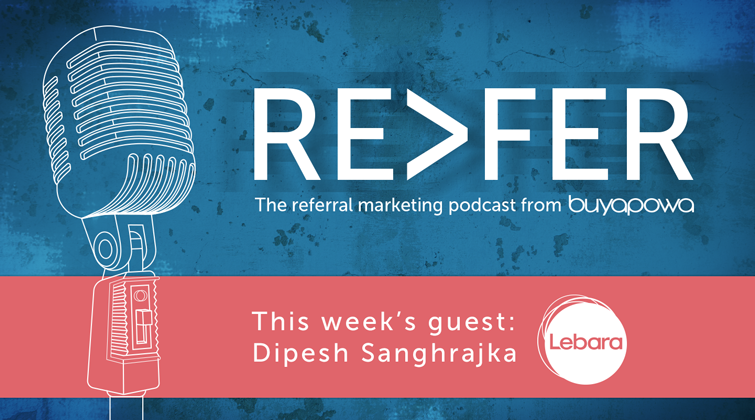 This week, Buyapowa’s Director of Client Success, Robin Bresnark, catches up with Dipesh Sanghrajka from Lebara’s Digital Growth team to chat about traditional marketing channels, online acquisition and, of course, referral marketing. Dipesh is a fascinating man and Lebara – one of Buyapowa’s latest clients – is a fascinating telecoms brand, set up specifically to serve migrant communities and to help family members, displaced across the world, keep in touch with each other. Fundamentally, Lebara serves communities – and that makes them an absolutely ideal client when it comes to referral marketing. When it comes to switching mobile phone network, the first thing we all do is ask our friends: “What’s the service like? How’s the signal?”. So referral’s a natural fit in telecoms. Add that to the sense of community Lebara’s customers have – where it’s all about helping your relatives and neighbours – and you’ve got something very special indeed. You can stream the podcast below, or just hit the download button to save it to your device. Enjoy!